In 3-quart saucepan, heat 1 inch water to boiling. Add potatoes. Cover; heat to boiling. Reduce heat. Simmer 20 to 25 minutes or until tender; drain. Cool 30 minutes to 1 hour. Cut potatoes in half; place cut sides up on serving tray. (Cut thin slice from bottom of each potato half, if necessary, to help stand upright.) Top each potato half with 1 teaspoon sour cream and dill weed sprig. Cover; refrigerate until serving. New potatoes are young potatoes and can have red, yellow or brown skin. 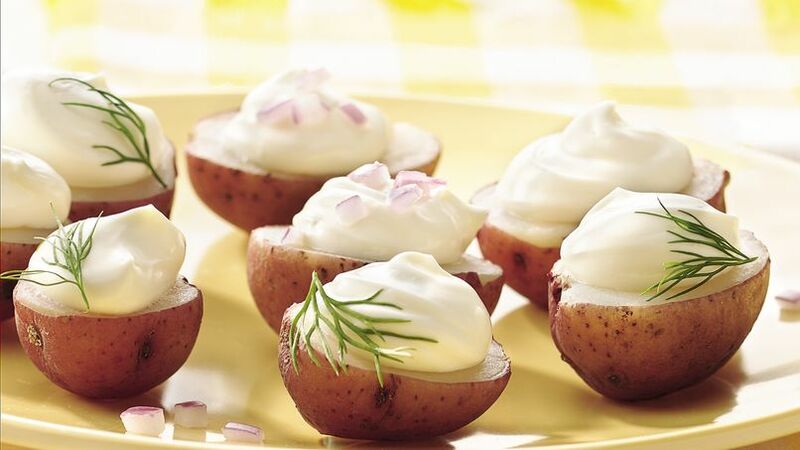 Because the skin is very thin and tender, new potatoes don't need to be peeled. For a spark of color, sprinkle a little finely diced red bell pepper or red onion over the potatoes.